Reading practice is more fun when it’s silly! 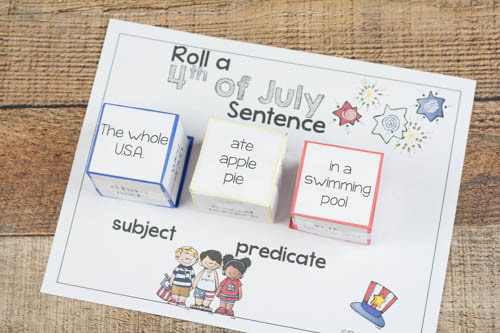 Make some silly sentences, practice reading, and have fun all at the same time!The Fourth of July is coming up quickly. We typically enjoy a quiet day, maybe have a BBQ or family get-together, and then head to bed at a normal time. I like my holidays fairly low-key. But we also like to get to bed early. Early bed times and fireworks aren’t a good combo! So we usually skip the live show on 4th of July. This year, I’m putting together some activities so we can celebrate a bit more. 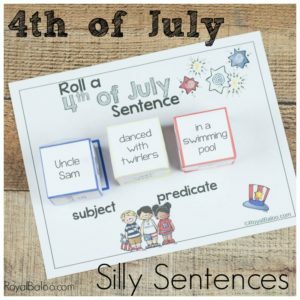 And that’s why I have a few printables to share – starting with my favorite, the Silly Sentences. My kids are loving the silly sentences so much that I feel highly motivated to make more. There is nothing like the giggles of 3 little kids who are picturing an alien doing a space dance. So a Fourth of July theme seemed perfect. I really just wanted an excuse to picture Uncle Sam swimming. First, you have to make all the dice. There are three of them but they go together fairly quickly. If you want the dice to last longer, print them on cardstock and hot glue them together. The board doesn’t need any prep. Just print and it’s ready! These are pretty straight forward to use! Throw the three dice in the air. We throw them all at the same time, but one at a time is fine too. Match up the dice to their color square. Then read your silly sentence! Change the dice or roll them all again for a new funny sentence!